The Antillean Manatee swimming off the coast of warm and sunny Puerto Rico. Ok – I thought I would continue my manatee trivia for you in the format of a question and answer, true or false. So here is the seventh installment. I know you will really impress your friends and family with your newfound manatee knowledge! This time, I’m talking about my first cousin, the Antillean manatee. Once again, manatees are very large marine mammals with two flippers and a body tapering down to a paddle-shaped tail. What is the average size of an Antillean manatee? The Antillean manatee’s average size is 8 to 9 feet long and it has an average weight between 800 to 1,200 pounds! The Florida manatee is larger and ranges in length from 8 to 10 feet. There have been occasions where the Florida manatee grew to 13 feet long and weighed 3,500 pounds! Clearly, the manatee is one of the biggest mammals in the world! True or False – The female Antillean manatee appears heavier and bulkier than the male Antillean manatee of the same length. This statement is true! The female Antillean manatee does appear heavier and bulkier than her male counterpart of the same length. True or False – Just like the Florida manatee, the Antillean manatee has a round-shaped body that tapers down to a paddle-shaped tail. True or False – The Antillean manatee, along with all manatees and dugongs have gills so they do not need to surface for air. This statement is false! All manatees and dugongs, including the Antillean manatee are marine mammals. As a result, they all need to surface every three to five minutes to breath air. However when they sleep, they surface about every twenty minutes to breath. True or False – The Antillean manatee’s body is covered with small hairs and their snout has stiff whiskers on it, which are called vibrissae. True or False – The Antillean manatee enjoys a diet of fish, eels, crabs, seahorses, and snails. This statement is false! The Antillean manatee, along with all manatees and dugongs are herbivores. As a result, their diet consists of seagrasses and aquatic plants. True! The Antillean manatee, along with all manatees and dugongs has unique lips, which assist them in gathering plants. And they also keep replacing their teeth for their entire life! 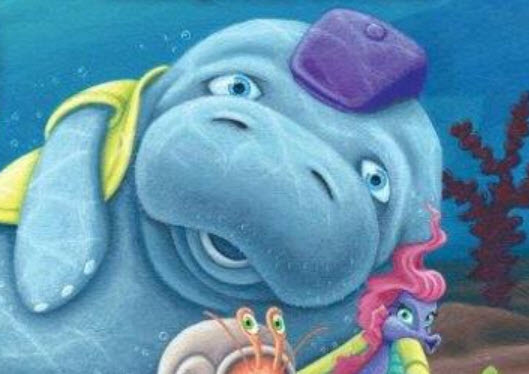 Since the Antillean manatee has nostrils, how do they function when underwater? 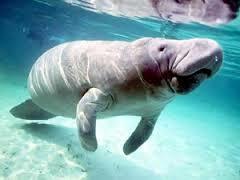 The Antillean manatee, along with all manatees and dugongs have nostrils, which act like small valves. This way, their nostrils can remain tightly closed when they are underwater and then open up when they surface to breath. True or False – The Antillean manatee reaches adulthood at about six years of age. True or False – Studies in Puerto Rico show that the Antillean manatee can live up to 27 years of age in the wild. True or False – The female Antillean manatee usually gives birth to one calf every three or four years after a gestation period of 13 months. This statement is true! Interestingly, there have also been a few cases of twin births. The calves are dependent on mom’s care for survival, and nurse for up to two years. True or False – The Antillean manatee feeds primarily on three seagrass species in Puerto Rico. These are; paddle grass, turtle grass and manatee grass. True or False – In addition to Puerto Rico, the Antillean manatee can be found along the coasts of the Greater Antilles, the Gulf of Mexico, the eastern coast of Central America, the north coast of South America, and finally, all the way to northeastern Brazil. Stay tuned as I blog about more interesting manatee news and trivia! Manatee Trivia (Part 7) – The Antillean Manatee!